The Nambudiri, also transliterated Nambūdiri, Namboodiri, Namboothiri, and Nampūtiri, are a Malayali Brahmin caste, native to Kerala. As the traditional feudal elite, Nambudiris owned a large portion of the land in the region of Malabar until the Kerala Land Reforms starting in 1957. Nambudiris have been noted for their unique practices such as the adherence to srauta ritualism and orthodox tradition. Cyriac Pullapilly mentions that the dominating influence of the Nambudiris was to be found in all matters: religion, politics, society, economics and culture of Kerala. The Nambudiri associate their immigration to Kerala with the legendary creation of the region by Parasurama. 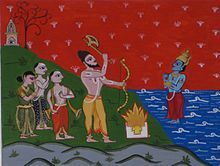 Nambudiri mythology associates their immigration to Kerala from the banks of Narmada, Krishna, Kaveri rivers with the legendary creation of Kerala by Parasurama, an avatar of Vishnu. According to this legend, the region was created when Parasurama threw his axe into the sea.. Although it is known that the present-day region of Kerala was once governed by the Chera dynasty, little information exists regarding its early ethnography. Anthropologists Heike Moser and Paul Younger note that the Nambudiri Brahmin presence predates the 9th century, as attested by grants of land given to them by ruling families. According to the historian Romila Thapar, local kings and chiefs encouraged them to move to the area by offering such tax-exempt land grants in return for them officiating in Vedic rites that would legitimise the grantors' status as rulers. They also gained land and improved their influence over the socio-economic life of the region by helping rulers during the wars between the Chola and Chera dynasties when Vedic schools were turned into military academies. Operating from their illam houses, Nambudiris' ownership of agricultural land under the janmi system increased over many centuries and, according to Moser and Younger, they "established landholding temples and taught the people the rules of caste". The Nambudiris have been described to be responsible for the Sanskrit influence on Malayalam, basically a Dravidian language, due to the Nambudiri Brahmin's mixing of Sanskrit and the local Tamil language. Medieval Kerala has been characterised as an oligarchy which was dominated by the Nambudiris, who owned all the temples and their subsidiary villages. The Nambudiris had influence with the ruling class through a process known as sambandam, where they would marry Kshatriya women from the upper sections of the Nair caste: the traditional military elite and ruling group of Kerala society. The children of such unions were not considered Nambudiris, but a part of their matrilocal lineages. As a result of such unions, nearly all the kings of Kerala, although considered Nairs, were offspring of Nambudiri fathers. These arrangements allowed the Nambudiris to gain political power in addition to religious and cultural dominance. The Nambudiri's grip on land was maintained through the practice of strict primogeniture and patrilineal inheritance. Despite their younger members having hypergamous relationships with Nairs, whose caste traditions were matrilineal, Nambudiri families remained aloof from general society. Although the historian E. K. Pillai has claimed that the Nambudiris from the 1100s enforced matrilineal polyandry on the previously patrilineal communities of the area, sociologist Randall Collins thinks it is unlikely that such a change could be imposed and says that "more probably it was the result of a process of marriage politics spread by emulation in the decentralised situation of status competition." Some other scholars believe that the matrilineal customs predate the period entirely and cite the queens of the Pandyan dynasty as evidence for this. The unwillingness of Nambudiris to adapt to changes in wider society persisted until the early years of the 20th century but Susan Bayly believes that their decline in significance can be traced to the period 1729-1748 when Marthanda Varma established the Kingdom of Travancore and chose to use Deshastha Brahmins from Tamil Nadu in his civil service. She believes that decision undermined the relationship between the Nambudiri Brahmins and royalty in the region, although others have said that Varma's influence was short-lived and that the main cause of change was the arrival of British colonial administrators, such as Colin Macaulay and John Munro, from the early 1800s. The British encouraged the work of Christian missionaries, notably in provision of education, and began the introduction of a judicial system that would have a significant impact on the landholdings, inheritance customs and marriage arrangements of both the Nambudiris and Nairs. The traditional basis of life was challenged by these and other changes, affecting also the other major ethnic groups of the area, such as the Ezhavas and the Syrian Christians. The following Vedic recensions are attested among them. Rigveda, the Śākala recension which is the only extant recension of the Rigveda across India. The Nambudiris follow both the Āśvalāyana and Śāṅkhāyana Śrauta Sūtras. The latter, called the Kauṣītaki tradition among Nambudiris is restricted to them. Yajurveda, the Taittirīya śākhā with the Baudhāyana, Vādhūla and Āgniveśya srauta sutras. Samaveda in the Jaiminīya recension, which is elsewhere found only among the Śōḻiya Brahmans. 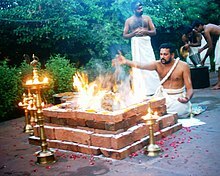 The ancient Vedic ritual of Agnicayana (the altar of fire), which spans a 12-day period and which Frits Staal and Robert Gardner claim to be one of the oldest known rituals, was maintained by Nambudiri Brahmins until at least 1975. Although it may have largely died out elsewhere in India and thus be symptomatic of the community's resistance to change, David Knipe notes that it is still performed regularly in Andhra Pradesh and has been for centuries. Traditionally, they wore a simple cloth around the waist called a thorthu (or thortumundu), in domestic settings. When they had to travel, they wore two sets of cloth in addition known as a vasthram. Nambudiris wore their traditional hair tufts (kuṭumi or śikhā) on the front like the Dikshitars of Tamil Nadu. ... among the higher-ranking Nayars (and Kshatriyas and Samantans) in contradistinction to the "commoner" Nayars, no two subdivisions admitted to equal status. Thus the relations set up by the tali-rite [ie: the thalikettu kalyanam] and the sambandham union were always hypergamous. Although it is certain that in theory hypergamy can cause a shortage of marriageable women in the lowest ranks of a caste and promote upwards social movement from the lower Nair subdivisions, the numbers involved would have been very small. It was not a common practice outside the higher subcaste groups and the Nambudiris had mostly stopped the practice by the 1920s. The form of Sanskrit theatre known as Koodiyattam, which is native to Kerala, was traditionally patronised by Nambudiris. It is the only surviving theatre of its genre and until the 1950s, was performed in temples by actors from high castes. The gradual decline in influence of those temples, which were losing landholdings as the century progressed, caused it to move away from its limited audience in order to survive. Now performed in more public arenas, it is watched by people with often less direct attachment to its origins. ^ P., Radhakrishnan (December 1981). "Land Reforms in Theory and Practice: The Kerala Experience". Economic and Political Weekly. 16 (52): A129–A137. JSTOR 4370526. ^ T.P., Mahadevan; Fritz, Staal (2003). "The Turning-Point in a Living Tradition somayāgam 2003". Electronic Journal of Vedic Studies. 10 (1): No 1 (2003): Electronic Journal of Vedic Studies. doi:10.11588/ejvs.2003.1.743. ^ a b Pullapilly, Cyriac K. (1976). "The Izhavas of Kerala and their Historic Struggle for Acceptance in the Hindu Society". In Smith, Bardwell L. Religion and Social Conflict in South Asia. International studies in sociology and social anthropology. 22. Netherlands: E. J. Brill. pp. 26–30. ISBN 978-90-04-04510-1. Retrieved 9 June 2011. ^ Mathew, George (1989). Communal Road To A Secular Kerala. Concept Publishing Company. pp. 23–25. ISBN 978-81-7022-282-8. ^ Moser, Heike; Younger, Paul (2013). "Kerala: Plurality and Consensus". In Berger, Peter; Heidemann, Frank. The Modern Anthropology of India: Ethnography, Themes and Theory. Routledge. p. 169. ISBN 978-1-13406-118-1. ^ Moser, Heike; Younger, Paul (2013). "Kerala: Plurality and Consensus". In Berger, Peter; Heidemann, Frank. The Modern Anthropology of India: Ethnography, Themes and Theory. Routledge. p. 170. ISBN 978-1-13406-118-1. ^ a b c d e Moser, Heike; Younger, Paul (2013). "Kerala: Plurality and Consensus". In Berger, Peter; Heidemann, Frank. The Modern Anthropology of India: Ethnography, Themes and Theory. Routledge. pp. 172–178. ISBN 978-1-13406-118-1. ^ a b Collins, Randall (1986). Weberian Sociological Theory. Cambridge University Press. p. 305. ISBN 978-0-52131-426-8. ^ Shanmugam, S. V. (1976). "Formation and Development of Malayalam". Indian Literature. 19 (3): 5–30. JSTOR 24157306. (Subscription required (help)). ^ a b c Prange, S.R. (2018). Monsoon Islam: Trade and Faith on the Medieval Malabar Coast. Cambridge Oceanic Histories. Cambridge University Press. p. 167. ISBN 978-1-108-34269-8. ^ Mahadevan, Thennilapuram P. (2016-01-29). "On the Southern Recension of the Mahābhārata, Brahman Migrations, and Brāhmī Paleography". Electronic Journal of Vedic Studies. 15 (2): 17–18. doi:10.11588/ejvs.2008.2.327. ISSN 1084-7561. ^ Moser, Heike; Younger, Paul (2013). "Kerala: Plurality and Consensus". In Berger, Peter; Heidemann, Frank. The Modern Anthropology of India: Ethnography, Themes and Theory. Routledge. p. 173. ISBN 978-1-13406-118-1. ^ a b Knipe, David M. (2015). Vedic Voices: Intimate Narratives of a Living Andhra Tradition. Oxford University Press. p. 46. ISBN 978-0-19939-769-3. ^ Hiltebeitel, Alf (2015). "Introducing the Mahābhārata". Religious Studies Review. 41 (4): 153–174. doi:10.1111/rsr.12271. ISSN 0319-485X. ^ Collins, Randall (1986). Weberian Sociological Theory. Cambridge University Press. pp. 300–301. ISBN 978-0-52131-426-8. ^ Gough, E. Kathleen (1961). "Nayars: Central Kerala". In Schneider, David Murray; Gough, E. Kathleen. Matrilineal Kinship. University of California Press. p. 320. ISBN 978-0-520-02529-5. Retrieved 2011-06-09. ^ Panikkar, Kavalam Madhava (July–December 1918). "Some Aspects of Nayar Life". Journal of the Royal Anthropological Institute. 48: 265. Retrieved 2011-06-09. ^ a b Fuller, Christopher John (Winter 1975). "The Internal Structure of the Nayar Caste". Journal of Anthropological Research. 31 (4): 283–312. JSTOR 3629883. (Subscription required (help)). Wikimedia Commons has media related to Nambudiri.